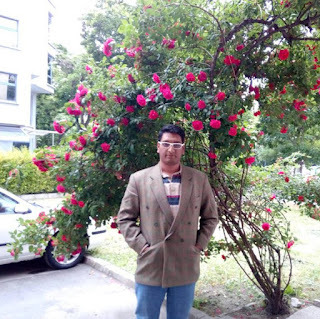 Using some user friendly widget button into blogger blog is become a common thing and if it do also have an eye-catching look then it definitely would be more great.We blogger always do have to concentrate on how to get moe traffic onto our blog.As per that we do need to place some subscribition button onto our blog asif one visitor do subcribe onto our blog they don't need to remember our blog any further,it would automatically deliver our blog article onto them.So it would also prevent us from loosing any traffic in future.Yes it would always better to place an email subcription widget onto our blog,so that they could get our blog right onto their mail.Today in this post we will show you how to add email subscription box in blogger,but before move onto the tutorial part you do need to have a google feedburner id.So first goto grab one by signingup there. 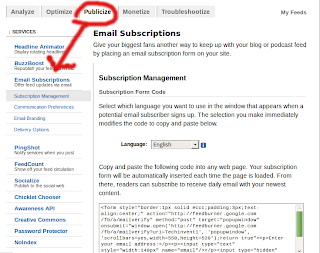 Then click on Publisize Email subscription on the left sidebar as per the below screenshot. Note:- If it is not already activated in your feedburner then first activate it. Copy the given code there. Copy and paste the second code above feedburner code and it will kinda look like the below after implementing. Just change "techtrickhome" to your feedburner ID. 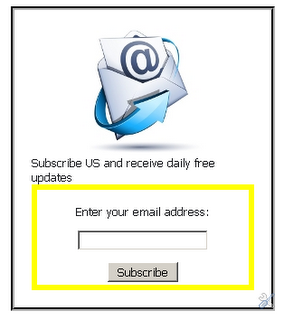 You can change "Subscribe US and receive daily free updates" with your own words. Do you have same post but for WP users?